LONDON (Reuters) - Prime Minister Theresa May's Brexit plans were thrown into further turmoil on Monday when the speaker of parliament ruled that she could not put her divorce deal to a new vote unless it was re-submitted in fundamentally different form. In comments that blindsided May's office, Speaker John Bercow said the government could not bring forward proposals for a vote in parliament that were substantially the same as had been defeated twice before, in January and last week. Brexiteers seeking a complete break from the European Union saw a "no-deal" exit as now more likely, but the government made clear it would seek to put off Brexitbeyond the March 29 departure date, if the EU approves. One of the government's senior law officers, Solicitor General Robert Buckland, said: "We're in a major constitutional crisis here." He told the BBC one way to bring May's deal back for a vote in the House of Commons could be prorogation - ending the parliament session prematurely and starting a new one. The pound fell to its day's low against the euro and the dollar on Bercow's statement, before recovering when the government said negotiations on a deal were continuing with lawmakers from Northern Ireland, who prop up May's minority government and have opposed her withdrawal accord so far. "This is my conclusion: if the government wishes to bring forward a new proposition that is neither the same, nor substantially the same, as that disposed of by the House on the 12th of March, this would be entirely in order," Bercow said. The ruling was welcomed by eurosceptic lawmakers in May's Conservative Party because it appeared to increase the likelihood of Britain leaving the EU without a deal. May's Withdrawal Agreement negotiated with the EU last year was seen by Brexiteers as leaving Britain too closely aligned to the EU while depriving it of voting rights in the bloc. "May I say how delighted I am that you have decided to follow precedent, which is something I am greatly in favour of," said Jacob Rees-Mogg, chairman of the European Research Group of eurosceptics in parliament. "Now the government will have to come back with substantial changes (which is literally impossible) in relation to the deal, otherwise it means a prolonged Brexitdelay," said Naeem Aslam, chief market analyst at retail broker Think Forex. Asked by a lawmaker whether further changes to the deal would be needed, Bercow said, "in all likelihood, the answer ... is yes", adding that a change in opinion would not constitute a change in the deal on offer. After two-and-a-half years of negotiations with the EU, the outcome remains uncertain - with options including a long postponement, exiting with May's deal, a economically disruptive exit without a deal, or even another EU membership referendum. May's blueprint, an attempt to retain close trading and security ties with the EU while leaving the bloc's formal political structures, was defeated by 230 votes in parliament on Jan. 15 and by 149 votes on March 12. "...After two-and-a-half years of negotiations with the EU, the outcome remains uncertain - with options including a long postponement, exiting with May's deal, a economically disruptive exit without a deal, or even another EU membership referendum..."
Up a creak without a paddle. Looks like they need to paddle with their hands in shark infested waters. Help me out here. Really! I am not a Brit. How was May's office "blindsided" by this? Does not anyone there know Parliament's rules and procedure, or whatever it may be called? Or, is there something more to the story that the OP's article has left out? Has this old precedent been normally ignored or interpreted generously in favor of the govt. or something like that? I did notice that they did vote on the proposal twice before. If not, it makes me wonder if May's team knows what they are doing. so what rules has he ignored? Got picture of his car with blox to brexit on it? Treacherous May certainly knows what she’s doing. She’s a fully fledged remainer intent on keeping the U.K in the E.U. 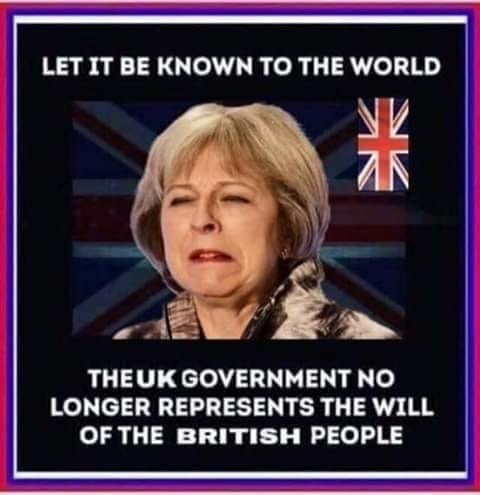 Even though the majority of her fellow citizens voted to leave. May and other politician insist that there can't be a 2nd referendum because the people decided already to leave. But she wants to repeat the "meaningful vote" as often as necessary to get the result she wants. It's good that at least one grown up was in the room and stopped her from doing it again. Interestingly, Bercow said that although this procedure was last enacted in 1910, this was because governments had respected the precedent outline in Erskine May. And it was already all over the press that this is his wife's car. He said it was his wifes car, I havn't seen the log book, have you, do you believe everything thing you read. He is the one with personalised Bercow number plates, he is the one driving around flaunting his impartiality. You would think someone of his neutrality ( ) would have enough nous to show more sense. He is the one with personalised Bercow number plates, he is the one driving around flaunting his impartiality. You just admitted you don’t don’t know whether it’s his car. I agree, which is why I was suprised to hear that he'd put his foot down re. a third vote - especially as it appeared as if more MPs were prepared to vote for her deal next time round? As posted by Basil B - "I suppose we will have to wait many years before a top civil servant/government advise sheds some light on this in their memoirs".